So You Want to Be a Pipefitter? If you want to find a career that gives you many avenues of employment within the field of welding, you might be wise to choose pipefitting. With this skill you can work alongside plumbers, steamfitters, and any other professions that work with specialized aquatic applications. It is a great way to fine-tune your expert use of welding equipment and jumpstart your career! When utilizing welding skills in the pipefitter’s trade, naturally the most common metal you will work with is copper. 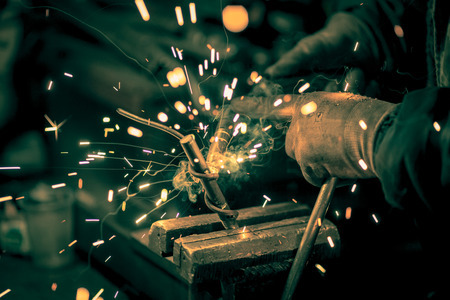 Please be sure to check out our recent blog article covering the basics of copper welding to get the run-down on that subject of welding knowledge. If you have questions about the best welding supplies to get you going on your career fitting pipes, just call the knowledgable staff at the Sidney Lee Welding Supply store nearest to your home in the Atlanta, GA region. Once you’ve got the right equipment from a reputable manufacturer such as Miller welders, you can apply your best welding techniques as a pipefitter. It’s all about the edges with pipefitting. Getting the precise gap between pipe and joint is crucial, and can take some experience before getting it right every time. As a pipefitter you will likely be utilizing a MIG welding machine, and so will require techniques different from what you might have been used to if you first learned to operate a stick machine. Another important factor in welding for pipefitting trades is the use of welding gas. It can be best to use mixed gases over pure argon gases so that you don’t have to worry about getting the right mix through a manual regulator as you go. Just call the folks at Sidney Lee, who you can trust to provide the perfect, regulated mixtures of welding gases in Georgia. If you’d like to learn more about common pitfalls of the pipefitter, check out this informative article by Miller Welders, one of Sidney Lee’s most trusted suppliers of welding equipment in each of our five Atlanta, GA area locations.